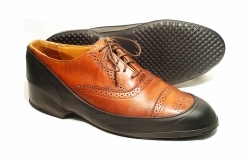 Low cut design does not hide shoe, yet protects in puddles, light rain and day-after snow fall. Tingley Boot Savers are the most popular boot rubbers in America. Will fit dress shoes, field boots, dress boots, and paddock boots. Never have sopping wet feet at a show (or at home) again! !